Gas chromatography mass spectrometry (GC-MS) is typically operated with a Nier type electron ionization (EI) ion source which is sometimes complemented by a chemical ionization ion source. Most GC-MS users are highly familiar with this "standard" EI ion source and are pleased with its performance and thus it is often accepted without questions about its limitations. An interesting question is what are the features of an ideal GC-MS ion source? In other words, what can be improved in the GC-MS EI ion source? A surprising aspect of the list of the ideal ion source features is that it is longer than commonly perceived, and in this note we attempt to discuss those features. Cold EI is an advanced EI ion source that performs electron ionization of vibrationally cold molecules in supersonic molecular beams and, as demonstrated, it takes the EI ions-source technology a big step forward towards the ideal. You can read more on Cold EI at the Aviv Analytical website of its 5975-SMB GC-MS with Cold EI or ask us for a review article (A. Amirav, A. Gordin, M. Poliak and A. B. Fialkov "Gas Chromatography Mass Spectrometry with Supersonic Molecular Beams" J. Mass. Spectrom. 43, 141-163 (2008)). Keep on reading for the full list of the ideal ion source features and operational properties, and for the improvement introduced by Cold EI which brings it closer to the ideal. The molecular ion is always provided. The molecular ion is the single most important mass spectral peak and an ideal ion source must produce it for all compounds. Standard EI only produces molecular ions for about 70% of the samples and as the compounds get bigger its relative and absolute abundance gets smaller. While CI provides molecular ions its response is highly non uniform, certain compounds are not properly ionized, its spectra are incompatible with library search and the closed CI ion source induces peak tailing and sample decomposition even more than standard EI ion source. Cold EI enhances the molecular ions which are provided for about 99% of the compounds. 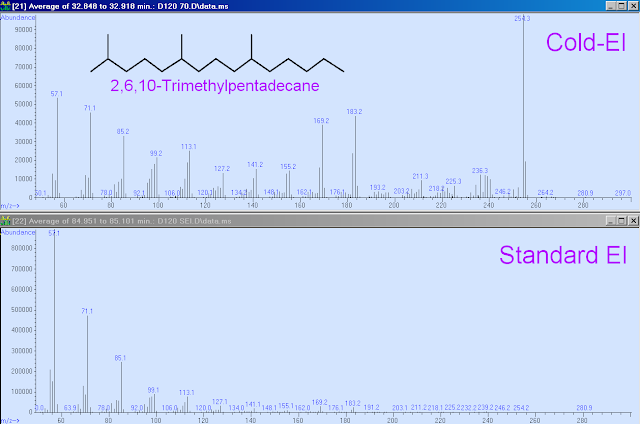 Figure 1 shows a comparison between the standard EI and Cold EI mass spectra of 2,6,10-Trimethylpentadecane. The qualitative difference between the two is the dominant molecular ion in the Cold-EI spectrum versus the absent molecular ion in the standard spectrum. These mass spectra where obtained from a real world complex petrochemical fluid thus the mass spectra contain some contaminations. Library based sample identification. One of the most important advantages of the standard EI ion source is that EI mass spectra are available in extensive libraries for easy and automated identification. Cold EI mass spectra, with their enhanced molecular ions, retain the lower mass fragments and are thus fully compatible with library based sample identification. Furthermore, while the enhancement of the molecular ions reduces the library (such as NIST) matching factors it often improves the library identification probability factors as described in another note in this Blog. Additionally, the availability of the molecular ions provides a good "manual" confirmation (or rejection) of the library identification via the identity of the molecular ion. Provision of accurate isotope distributions for the molecular ions. The ideal ion source must provide sufficiently abundant molecular ions, with accurate isotope distributions and without ion source related self chemical ionization or vacuum background interference. The standard EI ion source provides isotope distributions but often the molecular ion is too weak and can therefore be contaminated by self chemical ionization and vacuum background. Cold EI provides enhanced molecular ions with unperturbed isotope distributions. Isotope abundance analysis provides important information by itself and can serve to provide elemental formula. We developed the Tal-Aviv Molecule Identifier (TAMI) software that works with standard EI and excels with Cold EI. 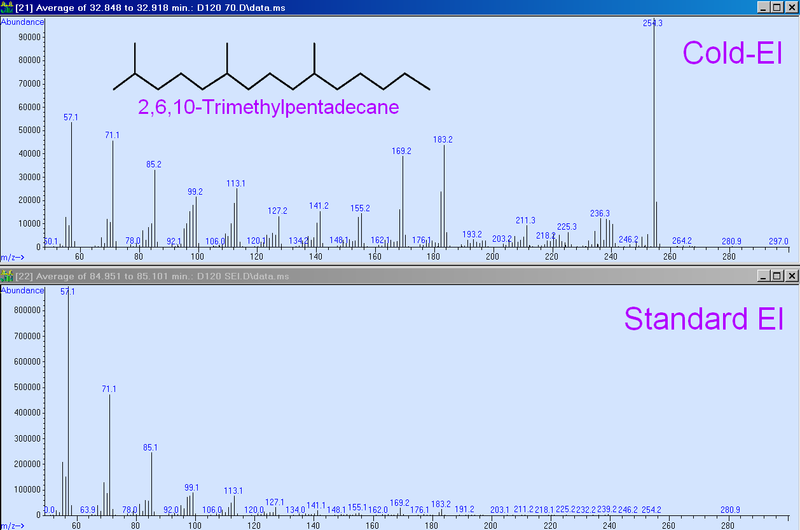 TAMI automatically converts the molecular ion group of isotopomers into elemental formulas and automatically (zero clicks) confirms or rejects NIST library identification. As a result, Cold EI with TAMI provides the ideal and ultimate sample identification technology for low cost unit resolution quadrupole MS. For further information on the TAMI software please visit its Aviv Analytical webpage. Prominent structurally and isomer related high mass fragments. Standard EI mass spectra excel in the provision of informative structurally related fragments (unlike with CI or ESI). Cold EI further enhances high mass fragments MS peaks and as a result provides even more structural and isomer effects as shown in other notes in this blog for drugs with the same elemental formulas but different structures and for hydrocarbon isomers Cold EI versus Standard EI. Figure 1 shows a comparison between the standard EI and Cold EI mass spectra of 2,6,10-Trimethylpentadecane. Clearly Cold EI is much closer to the ideal ion source in the provision of visible and abundant informative high mass spectral fragment peaks and these MS peaks can be related to the molecular ion which is absent in standard EI. Easy conversion to standard EI. While standard EI is not the ideal ion source, it is still the standard, and any ideal ion source should enable an easy back-conversion to standard EI such as for the provision of high library matching factors to isomers. Cold EI unlike CI enables method based (software controlled) easy and fast switching to "standard" EI for the provision of classical EI mass spectra. This conversion is simply performed via lowering the Cold EI make up gas flow rate without any need to physically replace an ion source or open the vacuum chamber (paper available on request). Fragmentation Tunability. An ideal ion source should enable full control over the degree of mass spectral fragmentation. In Cold EI in view of the elimination on intra-ion thermal energy, the reduction of the electron energy allows better control and reduction of the degree of molecular ion fragmentation. While Cold EI does not provide full fragmentation control (in many cases the effect is small), it still improves on this feature. Ion source sensitivity. Standard EI ion source is operated with 30-100 µA emission current and with magnetically confined electrons motion. This ion source provides good ionization efficiency which nowadays approaches 0.1% at the ion detector. The Cold EI fly-through ion source is operated with 12 mA emission current and with about three cycles for each ionizing electron thus it is more sensitive than standard EI despite the x10 faster motion velocity of sample compounds in the SMB. However, skimmer SMB collimation losses (x4-5) and ion mirror losses (x3) reduces the Cold EI overall ion signal which is similar to that of standard EI. The TIC of Cold EI is slightly (up to x2) lower than of the Agilent 5975 EI ion source for small molecules and bigger (without limitations) for large compounds. Ion source noise. A standard EI ion source has two major noise sources, vacuum background and helium metastable (neutral) related mass independent noise. While the mass independent noise was recently suppressed in standard EI ion sources via the use of improved ion detector and ion optics designs (such as the Agilent triple axis ion detector), vacuum background still remains and is the most prominent source of noise. While OFN specifications are obtained in a mass spectral region that has a minimal vacuum background noise, and with a new and clean vacuum system and electro-polished ion source (read more about it here), in real world applications vacuum background could be high and limit the obtained S/N. In Cold EI, vacuum background is filtered out in the dual-cage fly-through ion source. This filtration is enabled due to the fact that sample compounds in the supersonic molecular beams have a few eV directional kinetic energy, while vacuum background species have non-directional 0.1 eV kinetic energy at the ion source. This improved reduction of noise levels improves the obtained S/N in Cold EI and brings it closer to the ideal ion source. Ion source inertness. Regardless of the selection of ion source materials and the various claims made by vendors, standard EI ion sources are active due to the contact of sample compounds with metal surfaces, as all metals act as catalysts to degrade certain organic compounds. As a result, standard EI ion sources are not inert and induce sample decomposition for many compounds. Cold EI is an inherently inert ion source since it uses a contact-free fly-through ion source configuration. No sample contact inherently means no sample degradation at the ion source. Ion source peak tailing. One of the adverse GC-MS EI ion source effects is the ion source peak tailing. A small chromatographic peak tail hides, like an iceberg, a significant loss of TIC signal. Ion source peak tailing can be reduced at increased EI ion source temperatures but as the ion source temperature is increased the molecular ions are exponentially reduced for many classes of compounds. Ion source peak tailing reduces the chromatographic separation, increases the signal RSD, lowers the sample signal and increases its MS noise. With Cold EI, peak tailing is fully eliminated in view of the use of a contact-free fly-through ion source. Thus, as the sample size is increased and its volatility is reduced the gain in S/N with cold EI is significantly increased. Fast ion source response time. In fast GC-MS and or GCxGC-MS the need for a fast scan speed is often mentioned. However, the equivalent need for fast ion source response time is often ignored and neglected since almost all GC-MS systems use the same Nier type EI ion source which for semi volatile compounds exhibits peak tailing (hence the slow ion source response time). Cold EI uniquely provides sub 0.1 Millisecond ultra fast ion source response time in view of its fly-through elimination of peak tailing. The response time actually depends on the sample motion through the ion source which is about 15 µs. Extended range of compounds amenable for analysis. Ideal ion source should be applicable to all compounds. While this goal is impossible to achieve it is known that the Achilles heel of GC-MS is in its limited range of volatile and thermally stable compounds that are amenable for analysis. This limitation emerges from the GC injector, column and ion source and in CI the ion source limitation is even greater in view of its closed structure. Cold EI enables the significant extension of the range of compounds amenable for analysis via the use of short columns with high column flow rates in combination with full elimination of ion source degradation. A detailed paper on this topic is available on request. No column flow rate effects on ion source response. In standard EI (and CI) the ion source is designed to maximize the sample ionization yield at about 1 ml/min helium flow rate. Above this flow rate the ion source response begins to decline, new tune could be required and above a few ml/min the ion source response begins to sharply reduce. In contrast, Cold EI has no ion source flow rate effects. In cold EI the nozzle back pressure is stabilized at values of about 1 Bar (usually at 700 mBar) and as the column flow rate is increased or changed the added helium make up gas flow rate is automatically changed to maintain and stabilize the set nozzle back pressure. Thus, the supersonic molecular beam pressure at the ion source is independent on the column flow rate. This feature opens new and unique opportunities with column flow programming as demonstrated in our previous post on heroin analysis. Uniform, compound independent ion source response. The electron ionization cross section approximately depends on the number of electrons in the sample compounds hence on its molecular weight thus sample weight. As a result, EI TIC mass chromatograms are similar to those of GC-FID. However, as the sample compound becomes bigger ion source peak tailing becomes more and more pronounced and consequently the standard EI ion source response uniformity is eroded and lost. Cold EI provides uniform response regardless the sample volatility and provide it for about doubled range of compounds amenable for analysis. This feature is translated into a unique Cold EI capability to provide chemical reaction yields, unlike in any ESI LC-MS or standard GC-MS. A full paper on this feature is available on request. Compatibility with hydrogen or nitrogen carrier gases. In certain cases the helium supply could be interrupted and one might consider working with hydrogen or nitrogen as the carrier gas. As described in another blog article the use of hydrogen with standard EI could lead to the chemical activation of the GC liner and ion source while the use of nitrogen significantly reduces the ion source ionization yield due to significantly (x7) increased ion source space charge. Cold EI can uniquely operate with nitrogen as the column carrier gas and hydrogen as make up gas with minimal or no loss in sensitivity. Ion source robustness. Ion source robustness is a very important feature of any ion source. In standard EI the ion source requires periodic cleaning with an abrasive material to remove polymerised insulating material from its metal surfaces. The Cold EI fly-through ion source is highly robust and requires very little maintenance since ~75% of the sample compounds are eliminated by the entrance skimmer and from the rest 90% fly through the ion source thus only 2% of the sample compounds scatter from the hot (400ºC) and large ion source surface area. In addition, the quadrupole also remains clean as the ion source is separated from the quadrupole mass analyser by a 90º ion mirror. GC and column maintenance without venting. An ideal ion source should enable the replacement of column and injector liner without vacuum chamber venting and/or full injector and transfer line cooling. For standard EI a few "no-vent" devices were developed which require the addition of another EFC. Cold EI is operated with the SMB differential pumping thus enables the replacement of column without vacuum chamber venting and in addition it can tolerate helium pressure above 1 Bar to reverse the column flow rate and protect it during liner service, thereby eliminating the need for full injector and transfer line cooling are not needed. Price. This is the bottom line for many users. The price of standard EI ion source is moderate. The price of Cold EI ion source is similar to that of standard EI if a fully integrated ion source is available. The Aviv Analytical 5975-SMB GC-MS with Cold EI serves as an add-on system thus it about doubles the price of the GC-MS but this high price emerges not from the technology itself but rather from the fact that all its components are doubled (vacuum chamber, turbo pump, ion source, transfer line etc). Cold EI takes the EI technology a big step forward towards the ideal ion source for GC-MS and thus promise a bright future to GC-MS. An interesting topic is what should be the ideal mass spectrum as obtained from the ideal ion source. We prefer to discuss this topic with an example of Cold EI and Standard EI mass spectra of Fenvalerate which is a pesticide in which the cooling effect in Cold EI is not substantial and which presents a molecular ion also in standard EI. The ideal mass spectrum should exhibit a molecular ion and in our example both standard EI and Cold EI exhibit it as shown in figure 2 below. In addition, the abundance of the molecular ion should ideally be with a relative abundance between 50-100%, as it is in the Cold EI mass spectrum below. We do not want it to be the dominant MS peak since we may also wish to use a high mass fragment for confirmation and since matrix interference are much greater at low masses, thus we prefer the highest mass fragment m/z=225 to be the dominant mass spectral peak as it is in the Cold EI spectrum of figure 2, but not in standard EI spectrum. We wish to have a few more fragments for having unique library search and structural information but we do not need the fragments with m/z below 100 as they serve for no real purpose and just take intensity from the useful mass peaks. We also wish to have an accurate measurement of the molecular ion isotopomers as in Cold EI and without the small vacuum background noise that is exhibited in standard EI such as in m/z=207, 281 and 446 in the figure below. We note that the Cold EI enhancement of the molecular ion is only a factor of 3.2 in Fenvalerate while in hydrocarbons it can amount to over 1000 as described in this blog article. The overall effect of Cold EI as shown in figure 2 is to "move the center of gravity" of the standard EI mass spectrum to the spectral range of higher masses which is closer to the ideal mass spectrum. 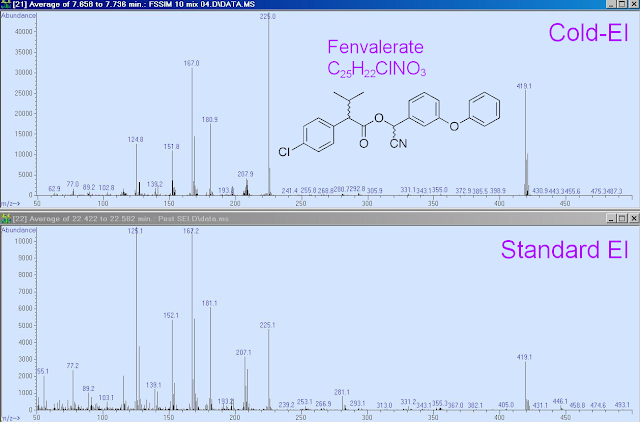 NIST search of the standard EI mass spectrum resulted in Fenvalerate identification as number 1 in the NIST hit list with 52.9% identification probability while in Cold EI the identification probability was 91.9% and it was also unambiguously confirmed with the Tal-Aviv Molecule Identifier software with 957 matching factor. Finally we note that the TIC signal and S/N were much better in Cold EI than in standard EI, and that the Cold EI peak shape was free from any tailing as exhibited in standard EI. Thus, as demonstrated, Cold EI serves as a step forward towards having the ideal ion source that produces the ideal mass spectrum. What do you think should be the ideal mass spectrum?